How can we affect long-term success at CFUM? Meaning, once our children move beyond our programming and into the world, how can we cultivate resolve, passion and perseverance as they encounter hiccups, bumps and maintain focus on their goals despite setbacks? This is the premise of Drake University student, Jamie Rusan’s work with CFUM. 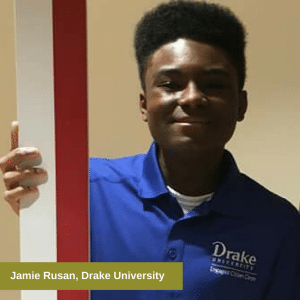 Rusan is a freshman at Drake participating in a student collaboration program called, Engaged Citizen Corps which requires him to complete 300 volunteer hours with a partnering organization. Currently local colleges like Mercy College of Health Sciences, Central College, Grand View University, Simpson College, and Drake University participate in similar student collaboration programs with CFUM. Rusan, a native of St. Louis, said this idea of determination and perseverance is called, grit. He’s currently researching the psychology behind grit and working to build it into activities and programming for all age groups of children at CFUM. “When we consider the children, we work with at CFUM, we recognize that they may face different challenges as they go through life. Character and their responsibilities to their community are great qualities we teach here at CFUM, but we also want them to have hope that they can navigate life’s detours and to stick with their goals no matter what age of their life,” Rusan said who is pouring over books and research on the topic of grit. Hannah Olson, CFUM’s Director of Programs, said this stick-to-it-ness of grit is key to success and overcoming any obstacle that presents itself. “We want all of our participants to understand that they are smart and capable young adults. We hope that by incorporating the concept of grit into our programming we can give them the tools they need to navigate the setbacks and challenges they may face as they pursue their own goals in school and in life.” said Olson who plans to implement Rusan’s program in the coming school year. In the past three to four years Olson said there’s been a national shift in the way programming presents character education. She said Iowa has missed a lot of it because the main focus for educators was on programming that centered on character-building. Expanding that programming to include grit, she believes, will allow CFUM to offer their children event stronger futures filled with hope and possibilities. Rusan is tasked with developing a plan for both teaching and assessing grit. To learn more about the psychology behind grit, watch this Ted Talks video by Angela Lee Duckworth.